But that's it from me. It wasn't a classic, but there was certainly enough to get the pulse racing. 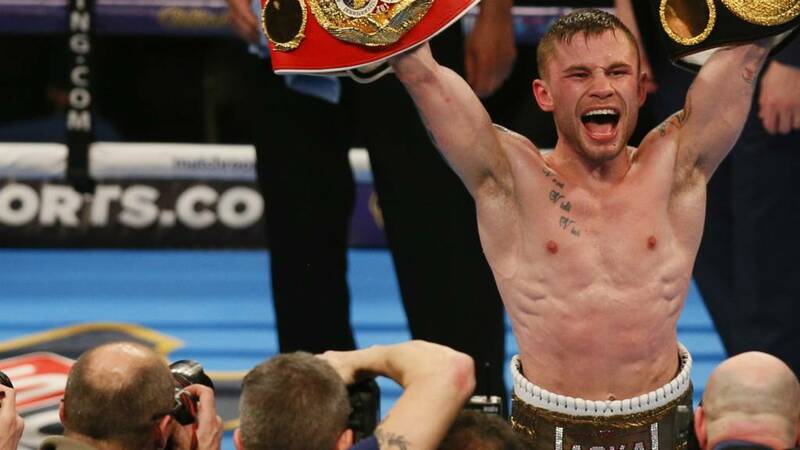 Now it's all said and done, Carl Frampton is the WBA and IBF super-bantamweight champion of the world. Ben Dirs has been our man at the Manchester Arena tonight. You can read his report right here. Keep listening to BBC Radio 5 live for all the reaction from the Manchester Arena. The boys will be on air until 00:30. "The body work from Scott Quigg was fantastic late on, but he should have started earlier"
"You have to force the pace and make someone like Carl Frampton throw when he doesn't want to throw." "I don't know what fight some people were watching. It was a slow-burner but those last rounds were pretty entertaining." More from Eddie Hearn: "The first six rounds were a little bit stale, but these fighters were not going to go toe-to-toe from off. Carl is a great fighter and a good man. We had our ups and downs with Barry and his team. "Quigg needed to use his assets better. I think he broke his jaw in the fourth round. I wish he started faster, because I believe he would have won the fight." More from Barry McGuigan on Radio 5 live: "Frampton went into another dimension tonight. Quigg is very brave and a great fighter but Frampton is an exceptional talent." Quigg's promoter Eddie Hearn: "I gave it to Frampton by a couple of rounds. I just feel Scott started too late. By the time Scott got his hands dirty, he was making up. I felt like he gave him too much respect." Frampton's promoter Barry McGuigan: "I don't think there's any point in a rematch. Santa Cruz is the one that appeals to me. It will have to happen soon because I want him to move up a weight." "I had it 117-111 to Frampton. How one judge gave it to Quigg I'll never know. Saying that, some on press row had it as a draw..."
IBF and WBA world super-bantamweight champion Carl Frampton: “The travelling support has been unbelievable - this isn’t Manchester, is it? Seems like it is Belfast. “I couldn’t believe it was a spilt [decision]. I don’t know what that lad was watching. He needs to take a long hard look at himself. “I knew it was going to be a boring fight - I had to sell it for TV. I knew I has the brain to do that and make it boring." "Overall Frampton's fitness was good, he picked up a really good lead and he maintained it despite a couple of tricky rounds at the end. But not really a good performance from Quigg." Former WBA super-bantamweight champion Scott Quigg: "In the second half of the fight I started putting my foot to the pedal and I had him going in the 11th. "I wasn't going to steam out at someone as good as Carl, I had to show respect to him. "He caught me with a good shot in the fourth. I think my jaw has gone. "Fair play to him, it was a great fight. With the judges' scorecards, I should have started faster, but it's too late now. "I would say this is the best atmosphere I've seen in a boxing ring." Paul Mulligan: I think there may be a few pints of Guinness poured in the pubs of Manchester tonight. "Quigg will look back at round 11 and know he had Frampton there for the taking but he stood off when he should have piled in. He should have gone all out. Carl was hurt." "I knew it was going to be a boring fight," says Frampton. You could have told us beforehand, Carl. "The first six rounds were clearly Frampton's. How you could have Quigg the winner I don't know. Quigg had the wrong tactics." Two of the judges gave it 116-112 to Frampton, the other had it 115-113 to Quigg.